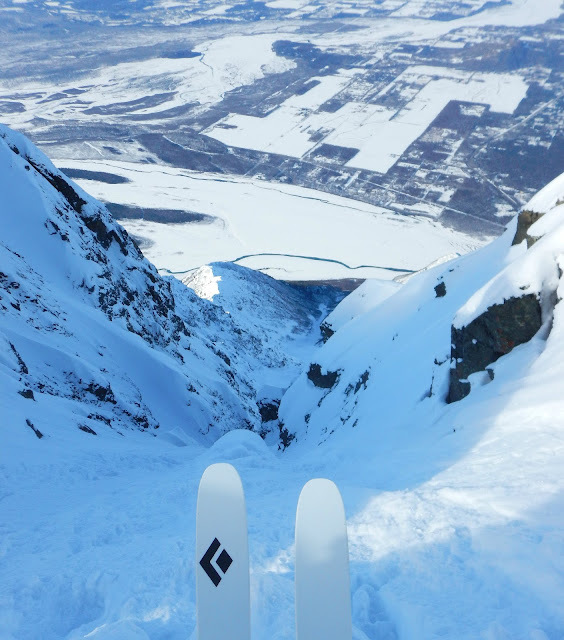 Over the last two days Brian and Sam had both skied Pioneer, and it was about to get a refresh - it was time to go get it. Only two small problems: I didn't own ice tools, and Alex had a project due at work. Easily remedied. That night I went to REI, and Alex called in sick with a bad case of powder fever. Pioneer's giant north face towering over Palmer. The next morning found us driving back and forth on the Old Glenn looking for the north face trail-head. After a few laps we'd located the appropriate thicket and were skinning into the alders. 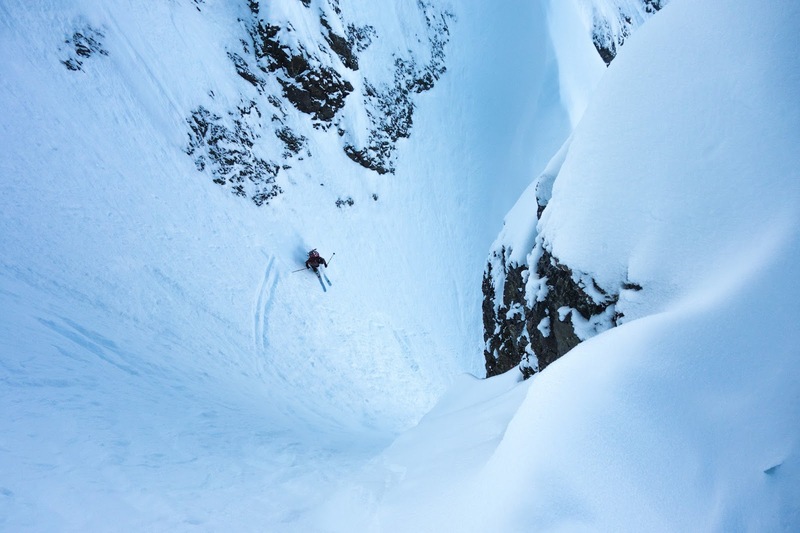 Within 500 vertical feet we'd reached the avy debris and were soon climbing mellow ice. I'd never used ice tools before, and was pleased to see how much better they performed than my finger nails and running shoes. Kind of like being a cyborg. After the first pitch we put our skis on and started skinning up the lower face. Bryon's tracks were still visible through the new snow and were a nice reassurance that we were on track. Or at least on Brian's wrong track. The new snow deepened and buried the old tracks as we approached the second ice pitch. The skiing was going to be fun. Brady tried out the second pitch and after having his crampons pop off a couple of times decided that he'd rather climb rock than ice. So, we clambered up the steep snow chimney to the left. I remember one particularly fun mantle and high step that was Alex's favorite part. A little more snow climbing and it time for the last ice of the day. The short vertical segment was fun and quick. Then we moved to the upper bowl. From Palmer the upper bowl looks like a steep hanging face. But, from its heart it feels like a huge catchers mitt. Low angle and relatively safe near the bottom, then steeping continuously to the peak. Filled with spindrift from the previous night's snowfall, the upper coolie was deep. We wallowed through it and crawled over the small rock steps. 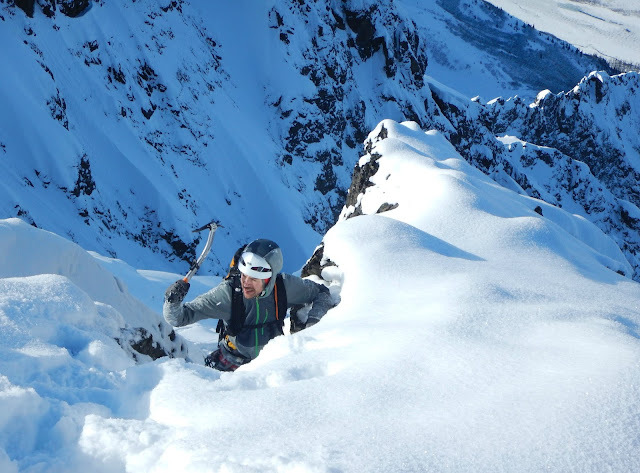 Popping out of the cold north face onto the summit ridge brought the sudden warmth of the spring sun. In front of us, the Goat Creek drainage sparkled thru thin clouds. 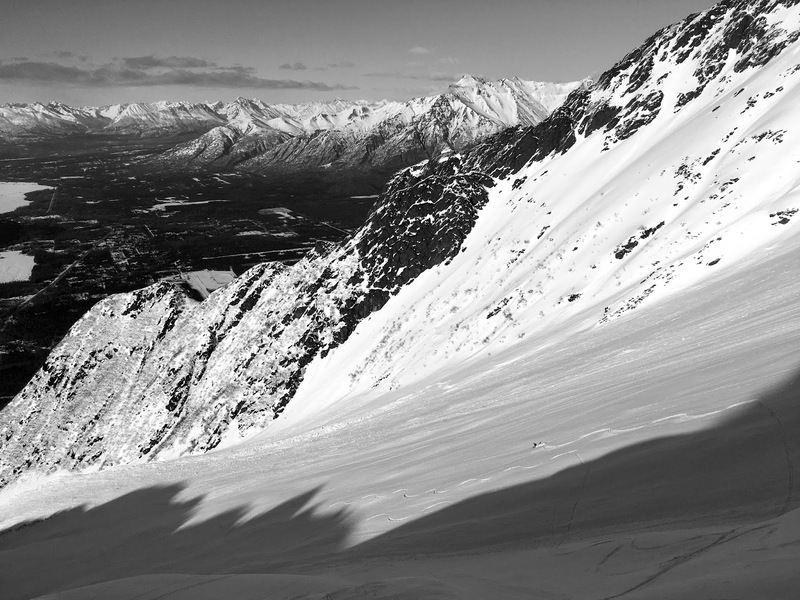 The Bold Ridge Hike from Eklutna to Pioneer is a fun a traverse above Goat Creek. As the clouds cleared we looked up the Knik Glacier at Mount Goode and the High Chugach. Jeff says that Mount Goode is a "good girlfriend ski". Whatever that means. After lunching in the deliciously warm sun we scooted back down to click into our skis at the top of the entrance coolie. Brady dropped first into the steep soft snow. On such a low tide year, the rock step at the choke wasn't covered and required a down climb or huck. Dropping into the supportable fluff I couldn't believe the good luck of getting to ski such a big line is such great conditions. Pulling over every few turns to let my slough pour by, I leapfrogged past the boys as the chute opened up. The summit couloir spit us out in the upper bowl. From Palmer the bowl looks like a steep hanging face. But, when you're there it feels like a huge catchers mitt. Low angle and relatively safe near the bottom, then steeping continuously to the peak. At the bottom of the hanging bowl it was time to take a hard left and traverse towards the rap anchor. Not completely sure where it was, and tenderly skiing towards the horizon line of what was obviously a large cliff was exciting. But, the colorful cordelette of the anchor stood out against the shaded rock, and we were soon inching along the edge towards it. Arcing down the lower bowl, the snow stayed soft, and we played tag all the way to the alders and the lower rappel. Dangling from and falling off of alders, we slid back down to the last rappel station. Done with that, it was a short walk down the concrete avy debris to the car. What a classic: moderate ice, 6k of vert, and a steep iconic line. I'd ski this every year!